Rolan is from Iowa, the heartland of America, and he is part of a farming family. The family farm is easily identified because of the huge American Flag painted on the family’s barn roof. It stands out amid the sea of corn and bean crops that surround the family home. In January 2009, Rolan was diagnosed with having a cancerous brain tumor located deep in the center of his brain and this tumor threatened to take his life. Because of the tumors location surgery to remove it was deemed impossible. Rolan shared his story with us one evening in his own words, and while I can not recount it word for word, several lasting impressions will stick with me forever. It was his astute teachers and his caring parents who connected a sharp decline in his academic performance at school to headaches Rolan was suffering from. Then through the grace of God his father had met a neurosurgeon who, when called upon, asked one or two questions and without hesitation directed the family to the largest hospital they could get to as fast as possible. Rolan credits that phone call and that mans advice for saving his life. Admitted immediately after a cat scan, Rolan began a two-year journey that included too many surgeries to recall and faced years of ongoing treatments to shrink the tumor in his brain. While in the hospital Rolan connected with the Doctors and nurses in his ward in a very positive way. He was know to have a set of full sized long horns attached to the foot of his bed and in “Boss Hog” fashion traveled the halls of the pediatric ward. One can only imagine the delight his courage and humor brought to others who were undergoing similar struggles. Rolan recounted coming out of the fog of yet “another surgery” to the sight and sound of his friend the surgeon leaning over him asking “Are you okay…How do you feel?” Rolan slowly raised his hand to his forehead making the universal “L” with his thumb and fingers and whispered ‘Looser” to the surgeon who then laughed out loud and concluded he must be fine. Today Rolan wants to share his story with others and credits Gods Will for having placed him in a position to now help others. He is a truly remarkable person with a tragic yet beautiful story that teaches us all how to live a better life in the face of adversity. He is a hero and an inspiration to us all. 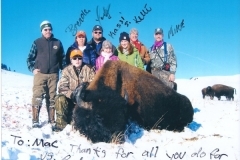 It is the purpose of Big Hearts under the Big Sky program, through our partners Catch-a-Dream, Hunt of a Lifetime, HAVA, and Casting for Recovery, to offer relief to families that have endured the stress and strain of managing some of life’s most horrific challenges. It is an honor for MOGA to be part of the Catch-a-Dream mission and together we are doing some extraordinary things. 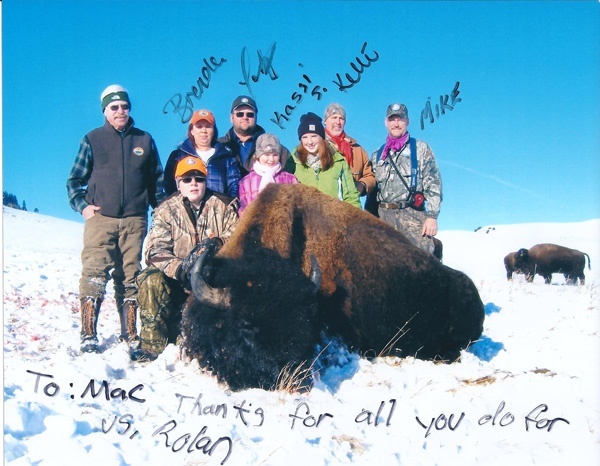 On Tuesday December 7, under the watchful and protective eye of professional hunter and guide Jim Doran, Catch-a-Dream Host Mike Adlium and Larry McGovern as rifle back-up, Rolan stalked and collected a 2,100 lb buffalo. In the field he was accompanied by the members of his loving family who witnessed something that two years ago seemed impossible to even imagine. Then last night at dinner we celebrated the opportunity provided us and in a very short time came together as caring human beings around a common goal; make the world a little better one person at a time.